Mark Good chats to Black Dyke Band's French soprano cornet star after the Queensbury outfit celebrated a famous victory at the Royal Albert Hall, securing the band's first 'double' in nearly two decades. Seasoned conductor, Jeremy Wise, is reinventing the contest wheel by throwing away the rule book for his resurrected Milton Keynes Own Choice Contest. Last month, Black Dyke Band secured the English qualification spot for the 2015 European Championships by virtue of being the highest placed English band at the recent National Final. Days later, Brass Band England announced that it would also grant Black Dyke berth not only at the 2015 European, but also at the 2016 event. Ian Brownbill looks into this sequence of events. Tom Davoren explores Canada's cool brass band culture following his visit to the Saskatchewan Brass Band Residency in Saskatoon. 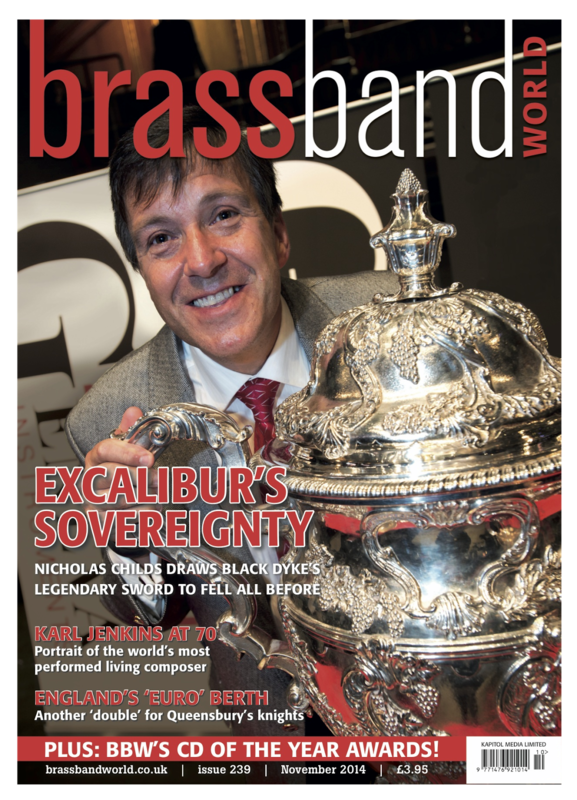 Black Dyke's Excalibur claims sovereignty - Christopher Thomas reports from the National Brass Band Championship Final at the Royal Albert Hall. Karl Jenkins at 70, lifelong friend Tony Small and close collaborator David Childs give their impressions of a remarkable man. A panel comprising of Christopher Thomas, Dr. Luc Vertommen Lucy Pankhurst and Les Neish asses the highest ranking releases featuring in Brass Band World's 2014 reviews catalogue.